The recent government shutdown may have cost federal contractors about $3.5 billion in contract revenue so far, according to Bloomberg Government analysis. The partial shutdown, which ran from Dec. 22 to Jan. 25, was the longest in American history, and affected 13 major agencies. During the shutdown, the idled agencies obligated about $1.7 billion—$3.5 billion less than they did during the same period in previous years, according to data available as of Jan. 31. The agency most affected was the National Aeronautics and Space Administration (NASA). NASA obligations during the shutdown were only about $28 million, compared with about $1.2 billion during the same period in fiscal 2018, when the government was running at full speed. The agency at the crux of the Trump wall funding debate that triggered the shutdown— the Homeland Security Department — also suffered significant funding deficiencies, spending about $831 million less during the 35 days than it did during the same period in fiscal 2018. Both small and large companies were hurt by the shutdown. Bloomberg Government spoke with executives of both small and large government contractors about the repercussions of the partial shutdown. The shutdown imposed hardship on smaller government contractors, according to Steve Weiss, president of Accelera Solutions Inc., a small technology business based in Fairfax, Va. He described the interruptions in obligations as a “cash-flow nightmare” for his company. Accelera received about $21 million in obligations, about half of which were from civilian agencies, in fiscal 2018. The delay in invoices forced him to prioritize payments to creditors and his employees, while limiting all other expenditures. Creditors tried to work with the company but demanded proof that the government’s bills would eventually be paid. Even now that the shutdown has ended, Weiss said he expects a 60-to-120-day delay before his expected invoices come in. Many large businesses resorted to furloughs. A senior official at a government contractor that does about $1 billion in federal business annually said his company had to furlough hundreds of employees because of access, supervision and payment issues with their government client. To reduce the impact on its employees, the company advanced paid vacation days to furloughed staff and created a pool of vacation days for them, contributed by workers with extra leave. In some cases, the company was able to shift affected workers to other projects. Even projects that were funded with state or local money were beginning to be affected as the shutdown wore on and federal contributions were delayed. In some cases, contract awards companies expected to win have been delayed, which disrupted business planning. Delays on construction projects that are also affected by weather considerations posed a particular problem. Non-U.S. citizen employees also felt the impact because of the State Department’s inability to process visas affected travel plans. While there is always a risk that government work is subject to damaging political factors, that risk has now been elevated, prompting companies to hedge their bets for next time. Shutdowns are unpopular — but it’s likely that another one will come along. Bloomberg Government has tools that can help contractors avoid some complications and continue winning business. Expand Your Customer Base: Federal contractors can mitigate short-term risk by focusing on agencies with more secure funding. The Department of Defense and Veterans Affairs are among the agencies funded for the full year, and lawmakers tend to be more risk-averse about interrupting their funding. BGOV’s contracts intelligence tool (CIT) can be used to scope spending at these agencies by analyzing by NAICS code, PSC code, or using Bloomberg Government’s proprietary market definitions. Don’t Miss an Opportunity: Bloomberg Government has thousands of opportunities listed in our database. Our predicted value algorithm and machine learning capabilities can save time and find the right opportunities being released by different agencies. Find New Partners: Companies can spread their risk through subcontracts or teaming with other companies. Using BGOV’s Partner Finder, clients can find other companies working in the same space. 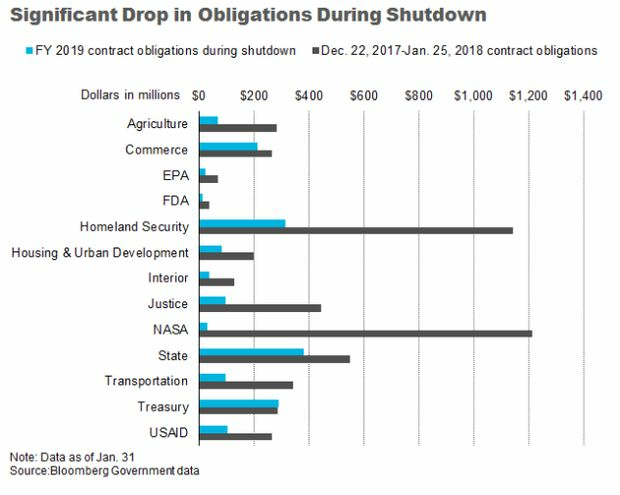 Although a larger prime contractor may have payments delayed by a shutdown, it may be able to continue payments to its subcontractors for some time, though as a shutdown gets longer this may be affected as well. Communicate With Customers:Agency Contacts can help clients engage with their government customers ahead of any future shutdown to understand how various contracts might be affected and plan accordingly. Policy Engagement: Bloomberg Government’s variety of government affairs tools can help companies engage with policy makers in government and help them understand the extent of the damage that government shutdowns can do.